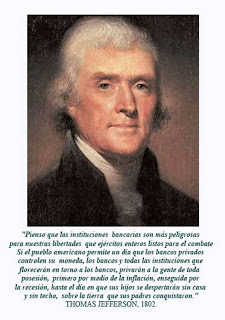 My colleague Begoña Zalbidea, head of the Department of Journalism, has given me this image and text by Thomas Jefferson, a very clever person... Our Economics experts haven't told us anything about the crisis before happening, and Jefferson said it a long time ago. If Thomas were here now, he would be the best American president, with Obama's permission... Awesome, Thomas' words.